"Spider-Man" is the name of multiple comic book characters from the Marvel Comics Multiverse. The original and most well known is Peter Parker created by Stan Lee and Steve Ditko originating from the Earth 616 universe. Within the mainstream Marvel Universe there have been characters that have taken the mantle such as Ben Reilly, Mac Gargan and Doctor Octopus. Outside of the mainstream universe, there are different incarnations of Spider-Man in alternate universes. Popular examples include characters such as funny animal parodies like Spider-Ham, an alternate future version named Miguel O'Hara, a daughter of Peter Parker named Mayday Parker in the MC2 universe, a different take on Peter Parker in the Great Depression era, the Ultimate version of Peter Parker and his successor, Miles Morales, along with a variant of Spider-Man where Peter's supporting character, Gwen Stacy becomes Spider-Woman instead of Parker. 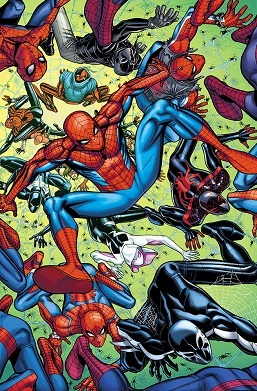 Originally, these characters were depicted as separate from each other, but they have crossed over together in storylines like "Spider-Verse", "Web Warriors", and "Spider-Geddon", in teams such as Spider-Army and Web Warriors, where the many different versions of Spider-themed characters are the major protagonists of the storyline. Some of these characters were temporarily merged in the same universe in the 2015 comic book series Secret Wars as a part of the Spider-Man family. There have been different version characters in other media that have crossed over in comics as well. Peter Parker, the Spider-Man of Earth-616 is the main incarnation of the character and appears in nearly every single piece of other media surrounding Spider-Man. The Spider is an alternative version of Spider-Man who merged with the Carnage-symbiote and has become a psychopathic killer. Before being displaced in time, he had been on death row in his home reality. He originates from Earth-15 and was a member of Weapon X. A Spider-Man who is a member of the Fantastic Five dies in a battle against The Spider. A Peter Parker is part of a mutant super hero team, Force-X, led by Emma Frost. His codename is "Spider". His outfit is the standard Force -X uniform and he wears goggles instead of a mask. Also, his webbing is organic. Morph fought a Demon Spider-Man on an alternative world. Later, the Demon Spider-Man was viewed briefly by Mojo and Major Domo as it attacked a young couple in a parking complex, but Spider-Man killed himself. Spider-Man: The Manga is a Japanese manga illustrated by Ryoichi Ikegami which retold the story of Spider-Man in a Japanese setting. It was originally published in Japan from January 1970 to September 1971 in Monthly Shōnen Magazine. The main character is named Yu Komori (小森ユウ, Komori Yū) to maintain the Japanese adaptation. An alternative version of Peter Parker also exists in the Marvel Comics 2 (MC2) universe, appearing as a supporting character in Spider-Girl. Regardless of his handicap, Peter returned to the role of Spider-Man several times. Once was to aid his daughter and Darkdevil, the son of Ben Reilly, against Kaine, another to convince the latest Spider-Man (the son of Jessica Drew), to cease risking his life, and in the 100th issue of the Spider-Girl title to save May from the Hobgoblin. Peter and MJ ultimately have a second child, Benjamin "Benjy" Parker Jr, who is temporarily rendered deaf after possession by the Carnage symbiote and being blasted with high-frequency sonics. Benjy later develops powers of his own at an infant age. [volume & issue needed] Peter was killed by Daemos, the brother of Morlun, during the Spider-Verse event while trying to protect Benjy and Mayday. Near the end of Spider-Geddon, the Other appears to resurrect him. Spider-like superhuman strength, speed, agility, wall crawling, can fire organic webs from wrists. In the same MC2 continuity as Spider-Girl, Gerald "Gerry" Drew, the son of Jessica Drew, inherits spider-powers and poses as Spider-Man. Created by Tom DeFalco and Ron Frenz, he first appeared in Spider-Girl #32 (May 2001), and is a supporting character of Spider-Girl. A spider monkey-themed Spider-Man appearing in Marvel Apes. The character was later killed off by Jennix in the Spider-Verse storyline. In the Marvel Nemesis: Rise of the Imperfects series, set in Earth-50701, Spider-Man was abducted by an alien scientist named Doctor Niles Van Roekel. The Thing, Wolverine, Elektra, Human Torch, and Storm are also abducted and injected with a drug in an attempt to corrupt them. Once infected Spider-Man's costume is brown-and-bronze with a blue spider mark in his chest. Spider-Man and the other heroes are eventually able to fight off the corrupting infection and defeat Van Roekel. In the aftermath of the invasion, Paragon and the Imperfects join together to share the Earth with the heroes. Marvel published a limited series called Powerless in 2004, which describes a Marvel Universe without super-powers. In this series, Peter Parker appears as a young man nicknamed Spider-Man on the internet. This version had also been bitten by a radioactive spider, but instead of getting super-powers his hand became atrophic. In this continuity, Peter is in love with Gwen Stacy; Mary Jane is not featured. Spider-Man 1602 appears in Spider-Man: Shattered Dimensions as an alternative costume for Spider-Man Noir, and in Edge of Time as a costume for Miguel O'Hara. Spider-Man (Max Borne), also known as Spider-Man 2211, is a superhero who appears in comics published by Marvel Comics. Created by Peter David and Rick Leonardi, he first appeared in Spider-Man 2099 Meets Spider-Man (November 1995). In Bullet Points, Peter Parker is Hulk and Bruce Banner is Spider-Man. Peter is killed by Galactus, and Bruce is killed by Daemos during the "Spider-Verse" event while trying to extract Kaine from Earth-616. Anansi. A playful trickster God based off the West African mythological figure of the same name. He is also featured in Spider-Verse. Izumi, a Japanese boy who is bitten by a Tsuchigumo version of Venom and transforms into Spider-Man. The Prince of Aracne, a knight version of Peter Parker in an altered retelling of Cinderella. He is killed by Solus in Spider-Verse. This is one of many manga-related Spider-Man characters. The character later crossed over in Spider-Verse with the Marvel Mangaverse version and The Manga version. This version of Spider-Man appeared in a four-issue miniseries (Feb-May 2009) set in the Great Depression Era of New York in the 1930s. Aunt May is a speaker for equality and spends time standing on a soap box shouting her beliefs. Uncle Ben was killed by a crime syndicate run by Norman Osborn, aka The Goblin. Shortly afterward, Peter is bitten by a strange spider and endowed with mystical spider-powers. He has a wall-crawling ability, increased agility, strength, and a form of spider-sense, and can spray nets of webbing from his hand. He dons a black mask, gloves, and a trench coat, and sets out to stop Norman and his gang. In Spider-Geddon, he is killed by Morlun. This version of Spider-Man appears in the game Spider-Man: Shattered Dimensions. This is a satirical version of mainstream Spider-Man in Not Brand Echh. Ultimate Spider-Man. 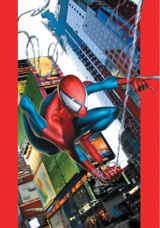 Cover to Ultimate Spider-Man (October 2000) #1. Art by Joe Quesada. Miles Morales as Spider-Man in Ultimate Comics: Spider-Man #1 (November 2013). Art by Sara Pichelli. 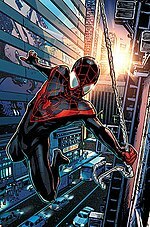 After Peter Parker's apparent death in Ultimate Comics Spider-Man #160 a new character by the name of Miles Morales takes up the mantle of Spider-Man as a thirteen-year-old superhero. On the sword and sorcery alternative Earth called Eurth The Webslinger is the alternative version of Spider-Man that helps Captain Avalon rescue his son from the Dreadlord. Alternative versions of Spider-Man appear in several issues of What If..?. In one major alternative universe Spider-Man joins the Fantastic Four; this universe is revisited in several different issues of What If..? During the Spider-Verse storyline, this version of Reed, Ben, Johnny, and Peter are killed by Karn. What if someone else besides Spider-Man had been bitten by the radioactive spider explores what would have happened if Flash Thompson, Betty Brant or John Jameson were bitten by the spider, but all three prove to be failures as the 'new' Spider-Man. Each story ends with Peter extracting the residual radioactive venom from the dead spider and using it to create a serum to give himself powers, thus becoming Spider-Man. Versions of all three appear in Spider-Verse where John is the only one that is not killed by the Inheritors. What if Spider-Man had never become a crimefighter explores a world where Spider-Man stopped the burglar from robbing the TV studio and continued his television career, becoming a public relations 'specialist' for superheroes until Jameson's angry attack on him for slacking off with his powers nearly results in Daredevil's death, inspiring Spider-Man to become a real hero. This version of Spider-Man is seen in Spider-Verse and apparently survived. What if the alien costume had possessed Spider-Man? sees Spider-Man being killed when he fails to go to Reed Richards for help in time to remove the symbiote, which goes on to drain the Hulk's powers and possess Thor until it is driven away by Black Bolt. In another issue named What if Captain America Were Not Revived Until Today?, Spider-Man joins an underground rebellion to fight an America turned fascist, aids the real Captain America in defeating the instigator behind this movement, and leading the chastised nation back to its democratic roots. "What if? : The Other", set during "The Other" storyline, features an alternative version of Peter who abandons the Spider when given the choice. Some time afterward, the Venom symbiote leaves its current host Mac Gargan and merges with Peter to become Poison. Another "What if?" universe has a version of Spider-Man who works side by side with his Uncle Ben to fight crime after Aunt May is killed. Another issue portrays a Parker whom the radioactive spider bite mutated him into a spider creature, as well as making his son a mutant. In a "What if?" Age of Apocalypse reality, in which both Charles Xavier and Eric Lensherr were killed, Apocalypse is served by clones of a symbiote Spider-Man, although the clones seem to be more symbiote than man. In "What If? Flash Thompson became Spider-Man" another version of Flash who became Spider-Man appears where he is a ruthless hero. He is still a bully to Peter who takes photos of Spider-Man unknown that he is Flash. When Peter finds out Flash's identity, he asks him to help save his aunt, but Flash furiously beats him to death. Flash wanting revenge against Doc Ock fights him, but he gets trapped under rubble similar to the 616 Peter. While trying to lift the rubble he realizes that he is a murderer and after freeing himself surrenders to the police. In "What If? Spider-Man became The Punisher" Peter wears a black costume with a skull on it and converted his web shooters to fire bullets. Despite killing criminals his life is similar to the 616 counterpart. When Green Goblin kidnaps Gwen Stacy, Peter kills Norman and succeed in saving Gwen. Peter decided to abandon the "Spider-Punisher" costume and live a normal life. Then a wounded Frank Castle who saw his family die to mobsters finds the Spider-Punisher suit. In the Armor Wars reality, Peter Urich is a nephew of Ben Urich who became Spyder-Man after being infected with the "spider virus". He was dating Kiri Oshiro, the daughter of Rumiko Fujikawa. Spyder-Man was killed by Technopolis' baron Iron Man after he discovered about the disease that forced everyone in Technopolis to wear armor. In Amazing Spider-Man: Renew Your Vows, a story that has Spider-Man and Mary Jane married with a daughter named Annie (who is developing Spider powers of her own). After being glimpsed at in the Spider-Verse storyline, Peter saves his family from Venom while most of the heroes die to Regent. He retires as Spider-Man to avoid detection from Regent and to focus on raising his family. However, he is later forced to don the mask again to stop Regent and protect his family. The second volume of the comic series details the later adventures of Spider-Man and his family. In a reality where Spider-Man sacrificed himself to save Prowler who feeling guilty for his death he continued Spider-Man's legacy as Spider-Hero. In No More—a story arc starting in Peter Parker: The Spectacular Spider-Man #303—a trip to the past to retrieve vital information resulted in Peter Parker changing his past when his younger self decided to abandon being Spider-Man because he felt, based on what he had seen and overheard of his future self's life, that such a career would only bring him pain and suffering. As a result, Peter Parker became a successful industrialist married to Gwen Stacy, but Norman Osborn has conquered the world, killing Iron Man and most of the Fantastic Four and imprisoning Doctor Doom, with Peter still hiding behind his corporate role even as Gwen discreetly aids the resistance as he believes that taking action as Spider-Man will only make things worse. In the Marvel Cinematic Universe film series (Earth-199999), Spider-Man is played by English actor Tom Holland and makes his debut appearance in Captain America: Civil War. Peter Parker first appeared as a child in Iron Man 2, who wore an Iron Man mask and glove and is saved by Iron Man while trying to "battle" the Justin Hammer's robots gone rogue. Parker was played by Max Favreau, the son of the film's director and portrayer of Happy Hogan, Jon Favreau. In Captain America: Civil War, Peter is found by and recruited into the Avengers by Tony Stark who provides him with a new suit in exchange for his help in dealing with Captain America and his faction who have gone rogue in the wake of the implementation of the Sokovia Accords. During the battle he proves to be a formidable opponent, going toe-to-toe with Falcon, Winter Soldier and finally Captain America himself, he later helps Stark and War Machine take down Giant-Man / Ant-Man but is injured in the fight and sent home by a grateful Stark. He next stars in his first solo movie Spider-Man: Homecoming, where he is mentored and monitored by Stark through the latter's chauffeur Happy Hogan (who is annoyed by him so much that the latter neglects his duty), while balancing his high school life with his vigilantism. He later stumbles on a group of smugglers and criminals stealing Chitauri technology left in the event of Avengers and were led by the mysterious Vulture, who is revealed to be the father of his high school crush and Decathlon leader Liz Allan and goes on a quest to defeat them to prove his mettle to Stark and his worthiness of being an Avenger which he dreams of becoming. However, after defeating Vulture, he declines Stark's offer of membership and decides to be a friendly-neighbourhood Spider-Man instead. Parker then returns in Avengers: Infinity War, he first appears in a school bus being alerted to Thanos' invasion and sets out to investigate and ends up saving Iron Man from Cull Obsidian. He later joins Stark much to the latter's chagrin in rescuing an abducted Doctor Strange from Ebony Maw, receiving the Iron Spider Armor made for him by Stark the previous year when he rejected Stark's offer in order to survive outer space. The two later kill Maw by ejecting him out of his ship into deep space and free Strange following which Parker is knighted an Avenger by Stark much to his delight. The trio head to Titan to confront Thanos where they are joined by several members of the Guardians of the Galaxy in combating the Mad Titan after an initial misunderstanding, but the heroes are ultimately defeated and upon Thanos snapping his fingers with a completed Infinity Gauntlet in Wakanda, Parker along with Strange and the Guardians (except Nebula) are reduced to dust alongside half of the universe with Parker being the last person on the planet to vanish, fading away in Stark's arms. Parker is expected to return in the upcoming Avengers: Endgame and Spider-Man: Far From Home. Designated as Earth 30847, not much of this Spider-Man is different from traditional iterations, except for the fact that the universe is shared by Capcom characters. This universe does not have a concrete lore, but the main plot of Marvel vs. Capcom does feature Spider-Man contributing to the battle against Ultron Sigma, a fusion of Ultron and Sigma from the Mega Man X series. When traveling through the multiverse, the Thing and the Human Torch get stranded in a universe with an apocalyptic Earth. This Earth is ruled by an evil version of Spider-Man who is wearing Captain America's mask. Peter Spector (Moon Knight's story with elements of Spider-Man's life) was attacked by Goblin by Night, who killed his Uncle Ben and aunt May. In near-death he is revived from the Master Weaver by a spider to be his avatar and is given spider powers, but splitting his personality into four. With his newfound powers he fights the crime with the name ArachKnight and is CEO of his company along with Harry Russell and Merly Jane. In the Venomverse an alternate version of Spider-Man who reunited with the symbiote after leaving Eddie Brock, is recruited with the other Venoms to fight the Poisons. He is later tricked by a Poison into thinking it was Aunt May and then got consumed by the Poison and became a villain to Venom. He was later blown up with the other Poisons from a bomb created by a Venomized Rocket Raccoon. Hasbro released an action figure of Poison in the Marvel Legends line. After being the first to be infected by a virus that turned people into cannibals, Spider-Man ate Rhino and took control of a piece of New York alongside Black Widow, Deadpool and Scorpio. He as Patient Zero hires Frank Castle to rescue a pregnant Mary Jane from Kingpin's group. Frank did exactly that, but he later kills Patient Zero. In this universe Spider-Man is a LEGO minifigure with a more funny personality in Lego Marvel Super Heroes. In an alternate future Spider-Man is an old man who got paralyzed from a Life Model Decoy Deadpool and lives in a retirement home with an elderly Wade Wilson. Unknown to Spider-Man, Oldpool was giving his blood to Peter so he would not die. In a battle between LMD Deadpools, Oldpool uses Doctor Doom's time machine and mistakenly switches places with the mainstream Deadpool. After they got to the main timeline they are reunited with the main Spider-Man and Oldpool. Then after stopping Master Matrix (the LMD master created from Peter's parents) and Chameleon, Old Man Peter and Oldpool fade away to their timeline. The various Spider-Men who appear in the storyline. Art by Gabriele Dell'Otto. In the Spider-Verse event, a multitude of new Spider-Men (and women) from throughout the multiverse are revealed. Billy Braddock alias Spider-UK, a British-based Spider-Man and a member of the Captain Britain Corps. He became a sole survivor from Earth-833 after his home reality was destroyed during Time Runs Out and chose to remain in the reality of the defeated Inheritors along with Anya Corazon. During the second volume of Spider-Verse set during the Secret Wars event, Spider-UK and Anya Corazon found themselves in the domain of the Battleworld called Arachnia with no memories of how they got there and eventually teamed up with Spider-Gwen, Spider-Ham, Spider-Man Noir, and Spider-Man: India, neither of them remembering their previous encounter during the original Spider-Verse. Following the conclusion of Secret Wars, the team of six Spiders will rename itself and be featured in a new ongoing series called Web Warriors, a name that was coined by Peter Parker from the Ultimate Spider-Man TV series during the original Spider-Verse. During Spider-Geddon, when the Inheritors came back, Morlun snapped Spider-UK's neck, killing him. An alternative teenage version of Gwen Stacy who was bitten by the radioactive spider instead of Peter. On this Earth, Peter Parker's anger at being bullied results in him transforming himself into the Lizard. When he dies due to the chemicals he used in the transformation, Gwen is inspired to use her powers to help others. Dr. Aaron Aikman is a young scientist who fights crime as "The Spider-Man" using a gadget-laden suit of high tech body armor. He is supposedly killed by Morlun. Patton Parnell is a disturbed, bullied teenager who upon being bitten by a radioactive spider, becomes a twisted, bloodthirsty variant of Spider-Man/Man-Spider and is subsequently killed by Morlun. Spider-Wolf is a werewolf version of Spider-Man of Earth-13989 killed by Karn. Spider Moon-Man of Earth-449 where humans have successfully colonized on the moon. He is killed by Morlun. "Golden Sponge Cakes" Spider-Man is a parody of the Spider-Man that appeared in Hostess-brand Cakes advertisements during the 1970s and 1980s. He is killed by Morlun. Old Man Spider of Earth-4 is Ezekiel Sims. He took the Spider-Man mantle after his reality's Peter Parker was killed by Morlun. He died during the Spiders' clash with the Inheritors but was able to warn Spider-Man (Earth-616) to protect the "Other" and the "Bride". Cosmic Spider-Man of Earth-13 is a version of Spider-Man who retained the powers of the Enigma Force following its possession of him. The side effect is that his abilities will only work on his Earth. He is killed by Solus. Cyborg Spider-Man of Earth-2818 is introduced during the Spiders' battle with Karn where the origin of his implants are never explained. He is destroyed at the hands of Daemos. Lady Spider of Earth-803 is May Reilly. Her father keeps a large number of animals in his study and when she is bitten by a spider she tries to pet, she realizes that like the spider, she too is caged. Lady Spider does not have spider based superpowers, but instead uses a steampunk set of mechanical spider legs. Spider-Punk (a.k.a. The Anarchic Spider-Man) of Earth-138. He is an African-American punk rocker named Hobart Brown who joins the Spiders' battle with the Inheritors. On his own world, he helped lead a populist revolution against corrupt President Norman Osborn and his Venom enhanced police force. Spider-Girl of Earth-11 is an 11-year-old girl named Penelope Parker who gains spider powers after being bitten by a radioactive spider. She dons a homemade costume and becomes Spider-Girl, despite viewing her new powers as "gross". After Earth-21205's version of Gwen Stacy died, an enraged Peter murdered the Green Goblin and becomes this universe's version of the Hobgoblin. Spider-Woman (Gwen Stacy) attempts to recruit him while on the run from the Inheritor, Verna. He dies saving Gwen from Verna. In an unidentified alternate reality, Arácnido Jr. is the son of a Luchador who died after being betrayed by his tag team partner. This version of Spider-Man protects the streets of Mexico City and wears a costume inspired by that of his father. On Earth-3123, Aunt May was bitten by the radioactive spider instead of Peter, and takes the identity of Spider-Ma'am. She and her family are confronted by Karn. Sensing that he is too strong for her, she proposes to offer her life for the sake of her family, causing Karn to hesitate for a moment (because she reminded him of his mother). Before Karn tries to kill her, the other Spider Totems intervene and convince him to join them in their fight against the Inheritors. In the Spider-Geddon event, a multitude of new Spider-Men (and women) from throughout the multiverse are revealed. On Earth-91918, Peter and Ben Parker live together in a Latin & Spanish neighborhood and Ben is married to a Spanish Aunt May. When Ben got shot by a mugger, he had a blood transfusion with Peter and got his nephew's Spider-powers. When Ben became a Spider-Man, he was a ruthless hero where he once severely beat up Kraven the Hunter. He alongside Peter battled crime until May died from unknown reason. On Earth-44145, Norman Osborn is a six-armed version of Spider-Man. As Norman is informed of Harry moving through Oscorp and having been secretly armed, he is told that Harry is on the 15th floor near Mr. Warren's lab. Becoming Spider-Man and arriving where a warped Cosmic Cube is located, Norman confronts Harry who dons the Kobold armor. It was revealed during the fight that Norman killed Peter Parker as Harry fires a laser beam at the warped Cosmic Cube. As Oscorp starts to disintegrate, Norman is pleased that Harry finally gave him what he wanted by accidentally giving Norman access to the multiverse. Just then, Spider-Punk arrives and pulls Norman out much to his dismay. In the end of the event, after destroying the Web of Life along with Spiders-Man, he is seen holding a piece of the Web inside a container with an evil smile on his face. In this universe of Earth-1048 set in the Marvel's Spider-Man, Peter has been Spider-Man for eight years, and he and Mary Jane are just friends after a breakup. He does not work for The Daily Bugle anymore, but instead works as an assistant to Dr. Otto Octavius who is Peter's idol and father figure, until Otto sought revenge against Mayor Norman Osborn. After a heartbreaking battle against Doctor Octopus, Peter gets the cure to Devil's Breath virus which was unleashed by Octavius, but is unable to save Aunt May because other people needed it so he was forced to sacrifice her. It's revealed that Aunt May knew about Peter's identity as Spider-Man. Miles Morales also appears where his father got killed from an attack by Mister Negative's Inner Demons and he got his powers from a genetically-altered spider which was brought unknowingly by Mary Jane Watson. In Spider-Geddon, Superior Spider-Man recruits Peter to fight the Inheritors after they defeated Tarantula. He is voiced by Yuri Lowenthal. In the universe of Earth-31913 that is based on the Old West, there's a cowboy version of Spider-Man called Web-Slinger who rides a Spider-Horse and has a six gun web-shooters. He was first seen investigating Doc Morbius' bloodsucking rampage and child abductions. After Doc Morbius is defeated, Web-Slinger is advised by Doc Morbius to rescue the children before the chemicals reach the flames. Web-Slinger does so as Doc Morbius perishes in the explosion. The children then notice that Web-Slinger's horse is wearing a mask and ask about it. In an unnamed alternate universe, an African-American girl named Margo is Spider-Byte in the Virtual Reality world. She is a genius student at the Peter Parker Memorial, Science & Technology. In this universe, the VR world has become equal to the real world and she is the Spider-hero of that world. Spider-Byte is first seen stopping a Virtual Reality identity thief who robbed someone's online account. Afterwards, she goes to her class. An unidentified alternate universe version of Spider-Man who lives in the Savage Land. When Peter and his family were flying inside a plane, the engine started burning and Peter's parents gave him the only parachute left in the plane to save Peter. Peter landed on the Savage Land where he was raised by a tribe of giant spiders. The spiders made Peter to go under the Trial of 1,000 Venoms where he was injected different poisons by the spiders to see if Peter would survive. He succeeded, and from the trial he got spider-powers. Now with his powers, he protects the land from the intruders like Wilson Fisk of the company Kingliner and Ka-Zar the Hunter when they are poaching dinosaurs. There was also a mentioning that Ka-Zar the Hunter's father killed the last of the Man-Things as he unknowingly sets off one of Savage Spider-Man's traps that nearly crushes Ka-Zar the Hunter. Savage Spider-Man then confronts Wilson Fisk who recognizes him as Peter Parker. A flashback in a discussion between Richard and Mary Parker and Wilson Fisk mentioned that Peter was supposed to stay with his aunt until something happened to his uncle. When Fisk's soldiers show up to attack, the giant spiders also arrive and attack the soldiers while some of them follow Fisk onto his airplane. Savage Spider-Man swings away as more giant spiders surround the airplane. Spiders-Man from Earth-11580 is actually thousands of spiders working in a hive mind that think they are Peter Parker. On this Earth when Peter Parker and Gwen Stacy visited the Horizon Labs, he fell in a pit full of radioactive spiders which consume him. His conscience is absorbed into them. When the Goblin Nation (this team is composed by Green Goblin, Hobgoblin, Demogoblin and Jack O'Lantern) arrives to kill Gwen Stacy, Spiders-Man saves her. After defeating the goblins, they abandoned the costume. Spiders-Man joins up with Superior Spider-Man's group. He also assists Spider-Man of Earth-44145 in a secret plan to keep the Inheritors on Earth-616. On an unnamed Earth; George Stacy got spider powers, and wears a black homemade suit (with white stripes included, in the upper part). He saves Betty Brant from a female version of Shocker. During the return of the Inheritors, Spider-Gwen's device to travel through the multiverse got destroyed by Verna and then Gwen got stranded in an alternate universe. In this universe Peter Parker and this universe's Gwen Stacy got a job at Oscorp and Peter wanted to create a cure for cancer, after his Uncle Ben died from it. Peter was experimenting with spider venom to create the cure but one of the spiders bit Harry Osborn making Harry this universe's Spider-Man. Harry alongside Gwen Stacy as this universe's Green Goblin started to fight crime together, until during a fight with the Sandman, both Harry and Gwen's father got killed. Spider-Cop is a version of Spider-Man who works for the New York Police Department in his reality. Described by Miles as a "grizzled veteran of the force," Spider-Cop wears a police uniform over his costume alongside a police cap, sunglasses, and a mustache over his mask. The Spider-Man of Earth-1048, who frequently assumes the persona of Spider-Cop in his own reality, is surprised that Spider-Cop actually exists. Spider-Cop later joins the other Spider-Totems summoned by the Spider-Man of Earth-616 and Spider-Gwen. A Stan Lee variation of Spider-Man appeared during the final battle of the Inheritors and when New U Technologies' cloning technology was used to revive the Inheritors as babies. Peter Parker's counterpart on Counter-Earth is mentioned as having "died from radioactive over-exposure". In another universe Spider-Man is a cat who is known a Spider-Cat and fights a psychopathic pigeon named Venom. In the Earth-691 continuity, Spider-Man is a time-traveler who aids Killraven in fighting a second invasion by the Martians from H. G. Wells' The War of the Worlds, during which he is killed. In Contest of Champions, a version of Spider-Man is killed by Venom, who then wears his costume as cape. Venom is then taunted by Spider-Man's voice, until he himself is killed. Deadpool encounters a version of Spider-Man in a universe which he refers to as "an Age of Apocalypse" (not the Age of Apocalypse). This alternative version of Spider-Man is Pestilence, a Horseman of Apocalypse. He has six arms, poisonous fangs, and engages in cannibalism. A monstrous version of Spider-Man was part of the Avengers of the Undead. This Spider-Man was later killed by Morlun. A female version of Spider-Man and of SP//dr appears along with other Heroes fighting Cosmic Ghost Rider in an attempt to stop him from raising baby Thanos. They are later killed by Frank with the rest of the heroes. There are many other versions of Spider-Man outside of comic books. Some in film, in television or in video games among countless other media. Some characters have crossed over in the comic book canon as one of the separate incarnations such as the Ultimate Spider-Man animated series version and the live-action Japanese show version appearing in Spider-Verse. Also, one of the alternate Spider-Men from the series final of the '90s TV show appeared in Spider-Verse as a background character, and the two live-action versions from the original trilogy and Amazing Spider-Man series are mentioned. The 2018 animated film Spider-Man: Into the Spider-Verse adapts the Spider-Verse storyline and the Ultimate Spider-Man books starring Miles Morales. Variations of Miles Morales, Spider-Gwen, Spider-Ham, Spider-Noir, SP//dr, Spider-Man 2099, and the Spider-Man from the 1960s animated series (voiced by Shameik Moore, Hailee Steinfeld, John Mulaney, Nicolas Cage, Kimiko Glenn, Oscar Isaac, and Jorma Taccone respectively) are featured. The film also features two different versions of Peter Parker. The version in Miles' dimension has been Spider-Man for over 10 years, was married to Mary Jane Watson, and also had a secret underground lair in Aunt May's backyard that housed dozens of different Spider-Man costumes and gear. In the movie's first act, he is killed by the Kingpin while trying to stop the villain from using a particle accelerator to access other dimensions. His death inspires the recently bitten Miles Morales into carrying on his mission as the new Spider-Man and stopping the Kingpin from endangering the city. Unlike other versions, the Peter native to Miles' dimension had blonde hair. He was voiced by Chris Pine. Spider-Man's exposure to the particle accelerator causes an alternate version of Peter Parker to get sucked into Miles' dimension. This version of Peter is in his 40s and has been Spider-Man for over 20 years. He was also married to Mary Jane Watson, but they divorced after he refused to have children with her. This coupled with the death of his Aunt May sent Peter's life into a downward spiral where he gave up being the wallcrawler, resulting in him getting lazier and overweight. He reluctantly agrees to mentor Miles on becoming the new Spider-Man to return to his home dimension, but later tries to prevent Miles from joining the other displaced Spider-Men when the young hero's inexperience begins to hold them back and volunteers to sacrifice himself so the other heroes can get home. Miles later joins them in the final fight against Kingpin and his minions after he learns how to control his powers and instills new confidence in Peter that he will successfully defend his dimension. Thanks to his experience with Miles and a run-in with an alternate version of his ex, Peter decides to give his relationship with Mary Jane another shot. He was voiced by Jake Johnson. ^ a b c d Spider-Geddon #5. Marvel Comics. ^ "Spectacular Spider-Man Adventures". Grand Comics Database. Archived from the original on 15 November 2013. Retrieved 10 July 2013. ^ "Marvel Promises Some 'Wild Things' From EDGE OF SPIDER-VERSE". Newsarama. 12 June 2014. Archived from the original on 15 June 2014. Retrieved 30 June 2014. ^ Peter David. Friendly Neighborhood Spider-Man #9. Marvel Comics. ^ Peter David. Friendly Neighborhood Spider-Man #10. Marvel Comics. ^ Peter David. Friendly Neighborhood Spider-Man #13. Marvel Comics. ^ C.B. Cebulski. Spider-Man: Fairy Tales #2. Marvel Comics. ^ C.B. Cebulski. Spider-Man: Fairy Tales #3. Marvel Comics. ^ C.B. Cebulski. Spider-Man: Fairy Tales #4. Marvel Comics. ^ Amazing Spider-Man Annual #38. Marvel Comics. ^ Incredible Hulks Annual #1. Marvel Comics. ^ Punisher Kills The Marvel Universe (November 1995). ^ Edge of Spider-Geddon #3. Marvel Comics. ^ Edge of Spider-Geddon #4. Marvel Comics. ^ Spider-Geddon #0. Marvel Comics. ^ Insomniac Games (September 2018). Marvel's Spider-Man. Playstation 4. Sony Interactive Entertainment. You do what you think is best, Doc. It's all any of us can... even when it hurts like hell. ^ a b c Vault of Spiders #1. Marvel Comics. ^ a b Spider-Geddon #3. Marvel Comics. ^ Spider-Geddon #2. Marvel Comics. ^ Spider-Geddon Ghost Spider. Marvel Comics. ^ Spider-Geddon #4. Marvel Comics. ^ Edge of Venomverse #3. Marvel Comics. "The Night Gwen Stacy Died"